Is a Sub 4 Hour Ironman Bike Split Possible? A shift has begun in Iron distance triathlon where we are once again seeing the rise of the Uber Biker. However, unlike 2004 and 2006 with Normann Stadler and 2009 with Chris Lieto, there are now several high power/low drag athletes crushing bike records across Iron distance races around the world. This recent trend has seen power numbers that can make your head spin. Joe Skipper rode to a course record at Ironman Texas in a time of 4:10 on a 310 watt average. Lionel Sanders reportedly held 313 watts at Ironman Florida in 2014 and by all accounts has an Functional Threshold Power (FTP) north of 370. To put this in perspective, in the past couple of years an average power of 285-290 would have been a top bike split at most Iron Distance races. While Kienle doesn’t release power numbers, it isn’t hard to believe that with his dominating bike performances at Kona he wouldn’t have big numbers to back them up. Jan Frodeno showed at Ironman Frankfurt that he can also go toe to toe with Kienle, besting him by 3 minutes on his way to a 4:08 bike split. There is also the man that probably most resembles the uber bikers of the past- Andrew “Starky” Starykowicz. Starky pushes the bike with everything that he has in the tank and tries to hold on in the run, as is evident by his record bike split of 4:02:17 at the 2013 Ironman Florida (where he didn’t quite hold on for the win). Going after 4 hours on an Iron distance course obviously requires great power and aerodynamics, but potentially just as important it takes extreme mental fortitude and focus. Any athlete going after the mark will know that it may be the only goal on the day. Overall race strategy and high placing will take a backseat to going under 4 hours on the bike. Holding on for the win would be nice, but an athlete going after the mark has to be ready to focus solely on the bike leg and see what happens when they get off the bike. That isn’t to say they won’t finish well or go for the win, but to go sub 4 the athlete must be ready for the pain that will come and the concentration needed to sustain a great position for the whole ride. While Skipper and Sanders have shown great power numbers, they are young and need high placements in big races. There is no reason for them to go for it at this point in their career. Kienle and Frodeno are on the other end of the spectrum, seasoned veterans focused on the biggest prize of all, Kona. There is no reason for them to derail their season to attempt such a mark. So that leaves Starky as the only athlete in the list above that has shown the ability and desire to put everything out there on the bike to ride close to that magical number. After coming so close in Florida, sub 4 has become his “White Whale” of sorts, and he has the mentality to go after it even if it kills his overall race. Let’s look at the potential course candidates to achieve a sub 4 bike split. An obvious choice would be the same course where Starky set his two previous record marks, Ironman Florida. That being said, he was probably going after Sub 4 in 2013 and came up a bit short. If we look at the type of numbers he would have put out for the 4:02 and what he would need for the sub 4 you can see it’s not as easy as just going 2 minute faster. As shown above, it takes roughly 7 extra watts for Starky to go from 4:04 to 4:02 in similar conditions, but to get that extra 2 minutes he will need to increase average power by an additional 12 watts. But what if we applied the power output from Ironman Florida to other courses? Obviously picking a course like Ironman Chattanooga (that measured 116 miles) would not work, but there is an Iron distance course where both the men’s and women’s records have been set in the past, Challenge Roth- where Starky just happens to be racing on Sunday. Challenge Roth has been the site of some extremely fast times, and one rider has actually already achieved a sub 4 hour bike split on the course. In 2009, Tobias Erler rode to a 3:59:11 as the cycling part of a relay team. Erler is a retired professional cyclist who has ridden for several UCI Continental Teams. Additionally, at Roth in 2011 Andreas Raelert set the current World Record in a time of 7:41:33 with the help of a 4:11:43 bike split. If Starky were to attack Roth with the same power needed to break four hours at Ironman Florida what could we expect? Despite the course being really fast, there are some rollers and a decent climb on each lap so the time we could expect if we used Starky’s same bike setup, position, and estimated sub 4:00 Florida power would be quite a bit over 4 hours. 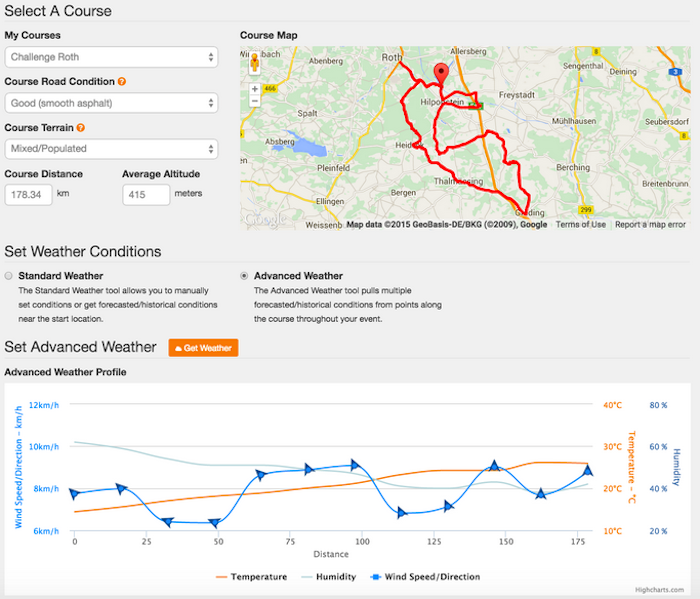 View the race plan in Best Bike Split. Note: Best Bike Split will be updating the weather models leading up to the race. If Starky does go for the record on Sunday, there are several critical factors that will play a major role. First, let’s consider his equipment and positioning. Advances in equipment and wind tunnel positioning have come quite a long way even from Starky’s 2013 Florida ride. 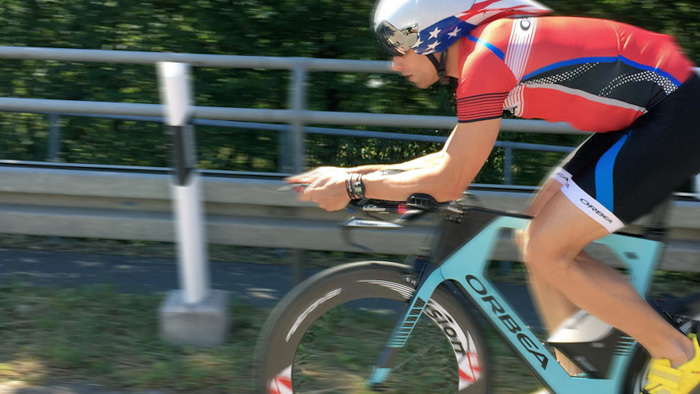 Starky’s bike sponsor Orbea recently unveiled a new TT bike at the Tour de France and with a couple trips to the wind tunnel we could easily see Starky improving his aerodynamic profile to similar levels of most upper level pro triathletes (~.235 CdA at 0 yaw). If we use this new aero profile we see a better result, but it he still wouldn’t break the 4:00 barrier. We also need to consider a major factor that is outside of anyone’s control- the weather. Looking at the current weather forecast for Sunday, which can change rapidly, there is an interesting wind effect that appears to happen across the course where the wind dips a bit into the predominantly headwind sections then picks up a bit for the cross/tailwind sections of the course. The gains from this however are fairly insignificant, amounting to 15 seconds at best. Given all of this, what will it take to break the record? 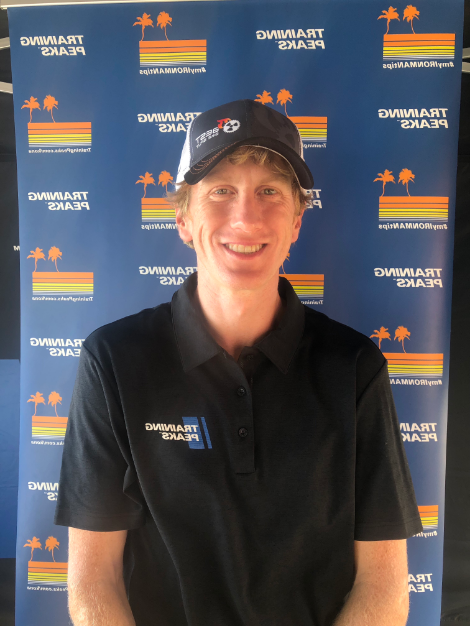 With arguably better equipment and a more aero position than he had in 2013, and favorable weather, Starky will need an extra 10 watts above what it would take to go sub 4:00 at Ironman Florida. At Roth, he will have to average an astonishing 345 watts for a 3:59 and some change. With an estimated FTP of around 400, that puts his Intensity Factor® (IF®) at .88, well above the recommended .80 to .84 that we have seen from Ben Hoffman, Luke McKenzie and others in Kona. What is similar to other races is his Variability Index (VI), which comes in at 1.03. The VI shows how evenly the power output was, and successful rides are between 1.00 and 1.05. These staggering numbers illustrate the incredible effort it will take for any rider to break the 4 hour barrier. Big power numbers, a good course, and favorable weather all have to line up at the right time. For Starkywicz, that may be July 12th in Roth. 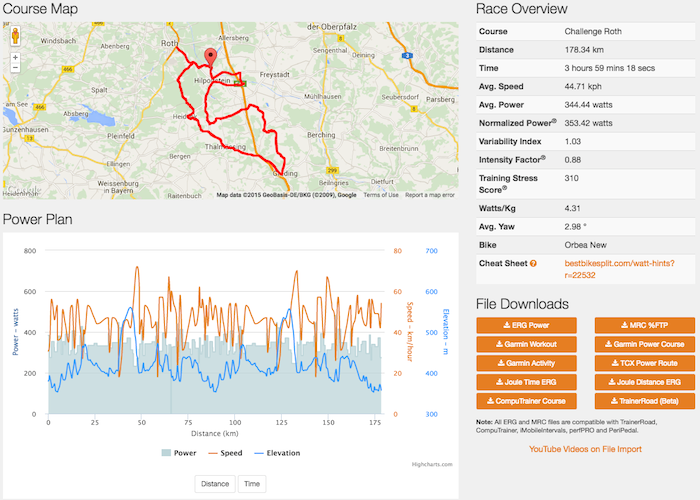 View the race plan in Best Bike Split to see how he may accomplish this amazing feat.